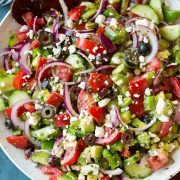 Watermelon Salad with Fresh Cucumbers, Feta and Bright Lemon Dressing is such a refreshing summer side dish! It has such a delicious blend of satisfying flavors and well balanced textures. Those cold juicy watermelon and cucumbers are just what you need on a hot summer day! 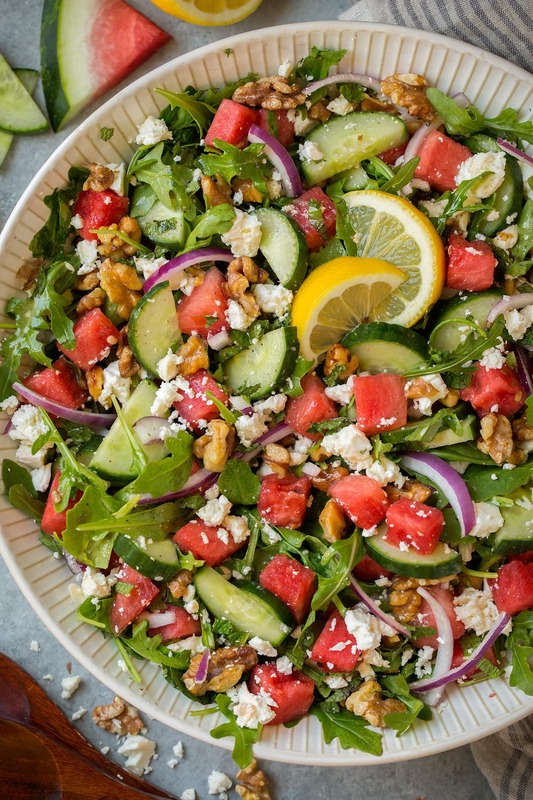 I’m loving ever last thing in this salad, and did you know watermelon and feta were 100% most definitely made to go together? Because there’s no doubt they are the perfect pairing. 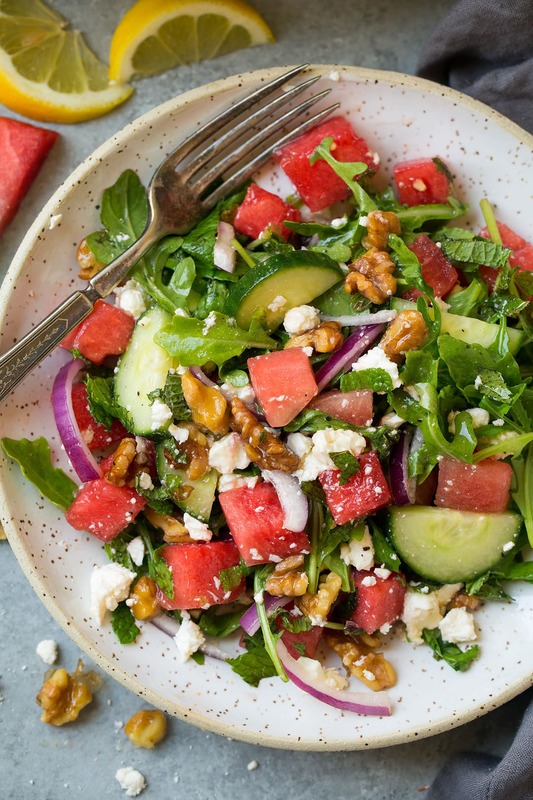 Sweet summer watermelon paired salty tangy feta is such a dreamy combo, especially made for salads like so. 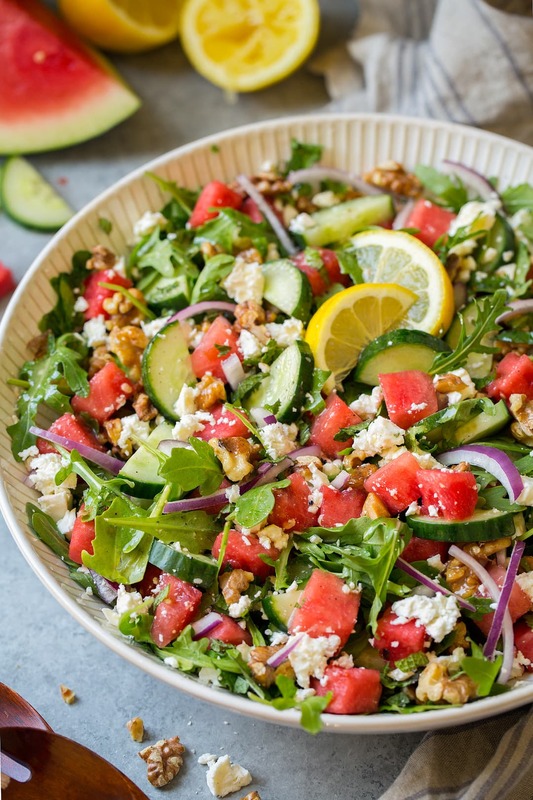 Then add peppery baby arugula, cool crisp cucumbers, toasty crunchy walnuts, a few red onion slices for flair, and fresh mint for another layer of well rounded flavor, then finish it off with a bright citrusy honey-lemon dressing and ooooh la la pass me another plate please! 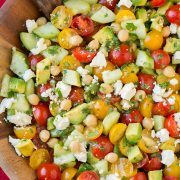 Another go-to summer salad to add to the list. Trust me, you’ve got to try this one! In a jar combine dressing ingredients. Cover with lid and shake to combine. Chill until ready to use. In a salad bowl layer together salad ingredients. Pour dressing over salad and gently toss to coat. Summer is all about the watermelon right? 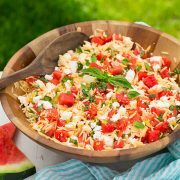 I love watermelon everything from those giant bowlfuls of fresh chilled watermelon slices, to Watermelon Popsicles and Lemonade, and even this Watermelon Orzo Salad. Then of course I love the watermelon themed treats (that may not taste like watermelon but they are just too cute), like my kids favorite Watermelon Rice Krispies Treats, and I neeeeeed to make these Watermelon Sugar Cookies Sally just shared (cutest summer cookies of all time!). And who can resist these colorful Watermelon Cupcakes Aimee shared? 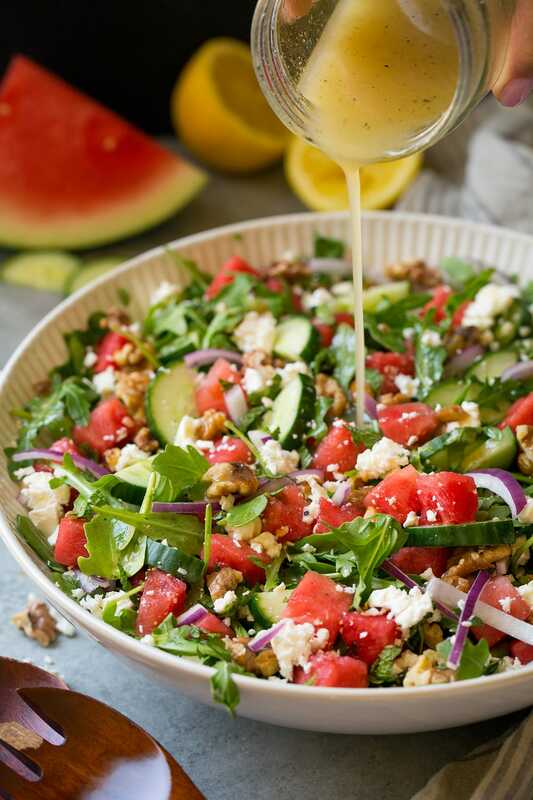 See, summer is all about the watermelon and here is another perfectly delicious and oh so refreshing watermelon salad recipe for you to add to the list! In a jar combine olive oil, lemon juice, honey, mustard and season with salt and pepper to taste. Cover with lid and shake to combine. Chill until ready to use. In a salad bowl layer together salad ingredients (I actually like to set aside some of the feta and walnuts to sprinkle over the top, they tend to make their way to the bottom of the bowl somehow). Shake dressing again then pour over top. Very gently toss to coat. Serve immediately.